Whether you want a disposable kit or a rebuild-able or moderated kit, we can help. We offer a wide range of parts and kits, so it's easy and quick for you to customise your vape exactly to your specifications. Customisation include rebuild-able tanks and coils, and once you've build your perfect kit, all you've got to do is pick your liquid and you're good to go. What about the personalised mug to commemorate an event? 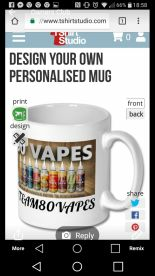 Our friendly printing experts here at Around The World In 80 Vapes are ready and waiting to deliver high quality, personalised mugs with a quick turnaround. Get in touch today to see how we can help. 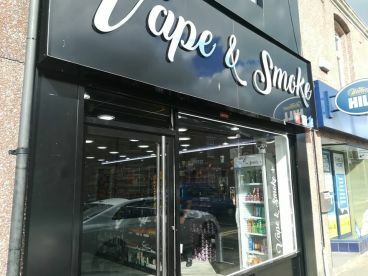 Vaping is an amazing way to conquer the urge to smoke, and with an incredible choice of strengths and flavours our vape shop is the perfect place for you to set yourself up, or restock your supply. Our experienced team will help you if you're a first-timer, or offer advice and discounts to return customers. 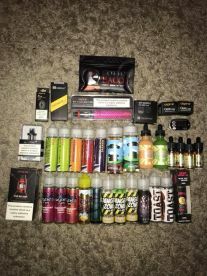 We offer a wide range of items including pipes, e-cigarettes, liquids and accessories. Please note that Around The World In 80 Vapes may not be able to honour booking requests made.